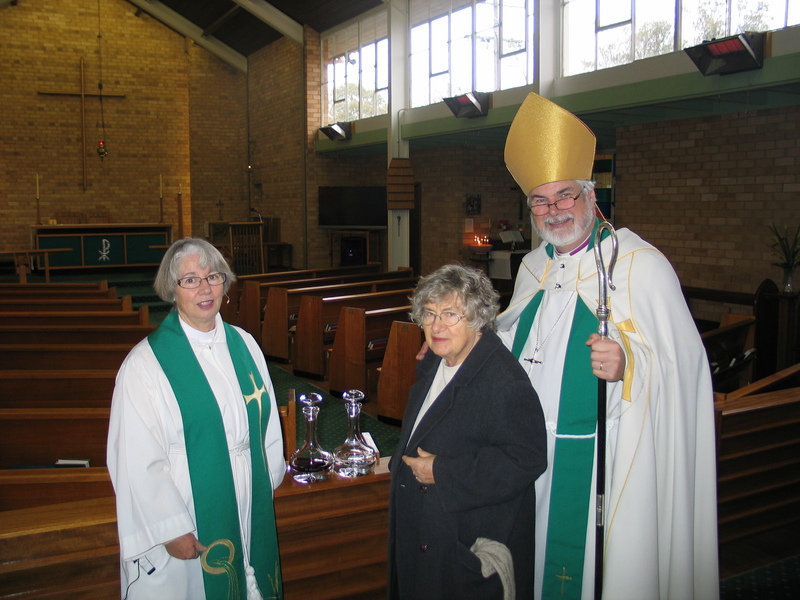 Dedication and blessing by the Right Reverend John Parkes, Bishop of Wangaratta, of the Cruet set, given in memory of Fr. Ralph Cohen, to St George’s Church, Numurkah on 14th July 2013. Ralph Cohen had a quiet, firm faith as evidenced by his strong involvement at an early stage with the worship life of the parish. Serving in the sanctuary became the norm for him and this led naturally to him taking on theological studies. He was deaconed in 1989 and then with Fr Grant Young’s encouragement he continued his vocation and was priested in St George’s Numurkah – a great parish occasion that many still remember. Ralph’s love of, and care for, the parish really shone through from that time on. He was a great help to rectors over the years – particularly after the amalgamation of Numurkah and Nathalia parishes – alternating services at St George’s and Holy Trinity with the incumbent for many years; the combined parish might not have survived without him. He celebrated at both Christmas and Easter when the service times in the two main centres made it impossible for the rector to take both. He kept the home fires burning, so to speak, in the interregnum between priests, taking on the role of locum on a number of occasions, often for lengthy periods. Ralph was a friend to many in the parish and was always ready to listen to those in need of counselling, providing sensible, down-to-earth advice. He smoothed the waters on many an occasion. When people were troubled or upset by something that was said or done he would visit them and discuss their concerns with compassion and understanding. Ralph served his Lord and this parish well and we are greatly indebted to him.